62 is the new 22! 60 when the Complete BBC Sessions set was released. Some people will just not get you…but those that really count will..
At 62, the usual passions remain undimmed. Yes it’s a fantastic job but one that does come with it’s own set of challenges. To pursue the various projects, generate business and sell the TBL product is a non stop 24/7 task – and a somewhat isolating one at times. I do have some amazing support and I’d like to once again single out Mike Tremaglio and TBL designer Mick Lowe for all they have done this past year working with me on the various TBL initiatives to fruition. At this point I’d also like to offer sincere thanks to every subscriber and buyer of TBL product this past year. Your support is very much appreciated. 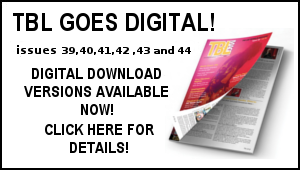 Distributed TBL issue 43 to over 30 countries across the globe. Contributed a piece to the Bob Dylan Picnic At Blackbushe book published by Wymer Publishing. 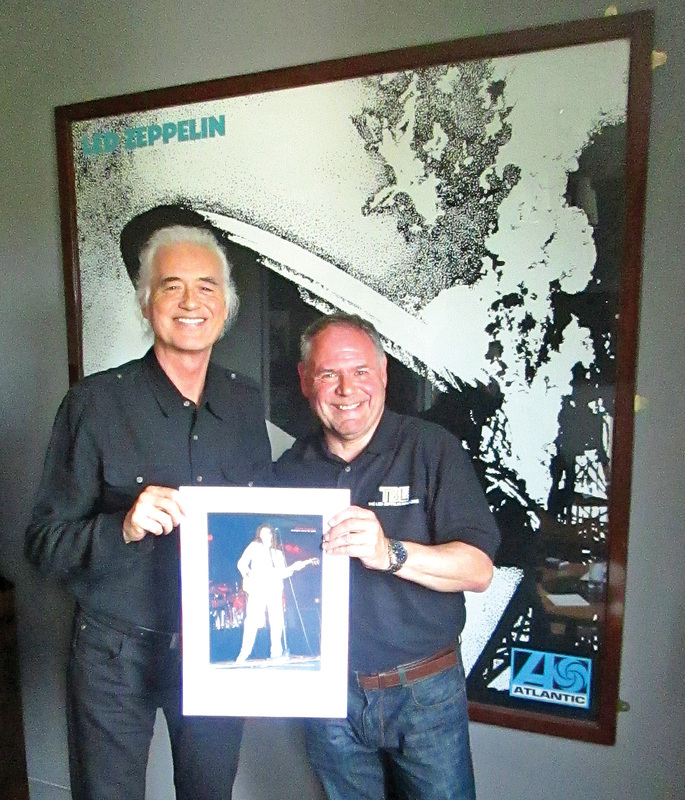 Completed work on and finally signed off the Evenings With Led Zeppelin book with Mike Tremaglio – without doubt the biggest challenge of my writing career. Edited the Led Zeppelin Live 1975 – 1977 book for Iconic Images – I’m really pleased how this one turned out. Written and collated the Led Zeppelin Their 50 Greatest Gigs with Mike Tremaglio for the 14 page feature that ran in the recent issue of Record Collector – another one I am very proud of. Hey I was also on News At Ten albeit for a mere ten seconds! Add to that the ongoing the weekly distribution of TBL book and magazine orders…well there’s no sign of retirement in sight! Then there is the love of football –and following the erratic fortunes of Tottenham Hotspur and England both of whom provided some amazing highs during the year – not least Gareth’s boys in the World Cup, the daily bike rides (my favoured mode of transport ) and socialising in the pub with friends. Pubs oh yes…I have a great affinity for the great British pub. Whilst I don’t drink much of it, I love the affinity people have with real ale. I do seem to be pictured many times with a pint of Fosters in my hand – but it’s not just that they serve alcohol – I love the differing atmosphere, the lay out –the sheer tradition of the British pub. Too many are closing of course which is a terrible shame. Those that remain should be coveted. Last Saturday I visited ten of them! As the years roll on – the fact is though, none of us are getting any younger – with a continuous stream of high profile passing’s, the thoughts of mortality are more prevalent than ever. So the days really are to cherish and with health issues to contend with ( I have my diabetes 2 condition t keep an eye on ) and the usual daily grind, it isn’t always easy – it isn’t all smiles and there are often tears behind the smiles. As I have previously documented here ( and like many others) I have had and continue to have issues with the black dog of depression. Coping with that can be tricky but luckily I am blessed with many precious friends. Alice Cooper/Humble Pie/Peter Frampton/The Yardbirds/The Allman Brothers/Little Feat/The James Gang/Credence Clearwater Revival/The Byrds/Pink Floyd/Jethro Tull/Cat Stevens/John Lennon/George Harrison/Paul McCartney & Wings/Queen, Traffic/Eric Clapton/Blind Faith/Derek & The Dominoes/Donovan/Family/Ronnie Wood/Mott The Hoople/ELP/Burt Bacharach/Paul Weller/The Jam and many more. As is well known, Vinyl Records are the music carrying format of my choice and whilst it’s vinyl I invest more in – I still love CD’s and I am always on the lookout for interesting stuff. It’s a shame how devalued CD’s have become – any charity shop will have a rack full for under 2 pounds – at the recent Harpenden Record Fair there were plenty of tired looking CDs for a similar low price. What I really find worth collecting are the extend double CDs and box sets such as Universal’s Deluxe Editions and Sony’s Legacy series and well packaged Led Zep bootlegs (of which I also have a fair few!) and I also own a variety of box set packages -David Bowie, The Beatles, The Rolling Stones etc. Also well worth searching out are the CD’s produced via the Castle/Sanctuary/RPM labels – these invariably have fold out covers with extensive notes and rare record sleeve images. A recent addition here has been Juicy Lucy – Who Do You Love/The Anthology. Juicy Lucy featured ex Misunderstood pedal steel guitarist Glenn Ross Campbell –they scored a top 20 UK hit with a cover of Bo Diddley’s Who Do You Love and recorded two albums on the Vertigo label –Juicy Lucy (with a very distinctive album cover featured a burlesque dancer named Zelda Plum, covered in fruit) and Lie Back and Enjoy It – various line up changes ensured and they later recorded on the Bronze label. All this is superbly explained and illustrated in the fold out booklet that accompanies this excellent overview of their work. Meanwhile back to vinyl – the collecting of vinyl albums and singles continues to be a real passion – ever increasingly so! 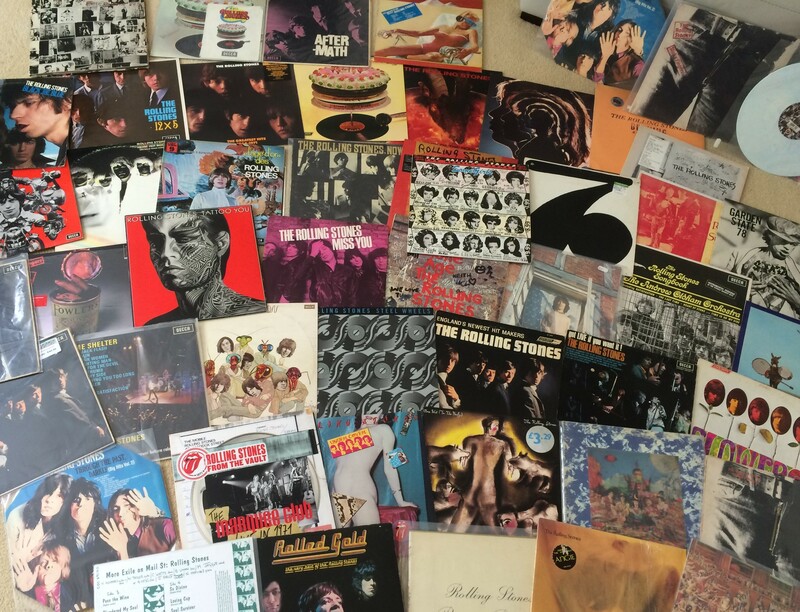 As my good friend Dec notes, I seem to be on a quest to invest in every rock album released since 1968 –it’s not quite as bad as that but boy do I love re connecting with the long playing format. Big time. Well for me in an ever changing technological social media driven world,the LP and single record is a true bastion of past values – values to be held on to and cherished. Vinyl is the true everlasting music carrying format.The sleeve art work, the size, the tangible feel, the smell..and the sound – living breathing vinyl grooves…and of course that most comforting of sounds…the initial surface noise as the needle hits the vinyl…sheer bliss in my world…and countless others – note least of course one James Patrick Page – I have been fortunate enough to see his own passion for record buying at close quarters. In recent years I have got right back into collecting singles -I have over 2,500 of the little gems. 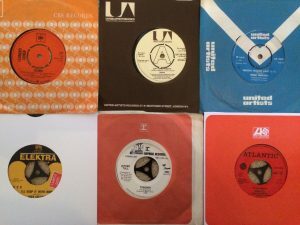 The quest originally being to snap up the singles I would have purchased in the years 1969 to 1972 had I had the required cash to do so. That has by and large been achieved but I still love snapping up odd couplings and obscure labels,orgotten gems etc. In London, there’s Fopp in Cambridge Circus, Sister Ray and Reckless Records in Berwick Street and the nearby Sounds of The Universe, continue to come up with some great stuff. 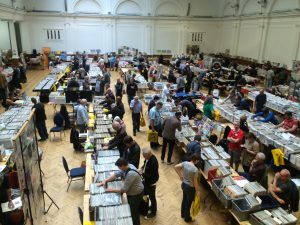 Then there’s the London Olympia and Victoria record fairs and Spitalfields market. The nearby Hitchin market is another good source as is Empire Records in St Albans and Wax Factor and Across the Tracks in Brighton. In Cambridge there’s Black Barn Records and Leighton Buzzard’s Black Circle Records is also excellent. As everybody reading this knows, in Bedford, Darren Harte’s Vinyl Barn stall on Bedford market on Friday’s as something of a weekly vinyl haven. I am there most Friday mornings checking the new arrivals – and Darren continues to come up with interesting fresh retro stuff. The Slide Record shop in Bedford which opened last September has also been a regular source of interesting LPs and singles. Our trips out for the annual Record Store Day is always one of the highlights of the year. This year on Record Store Day we visited the excellent Black Circle Records in Leighton Buzzard and Bedford’s Slide Records. It was one of the best Record Store Day’s to date. 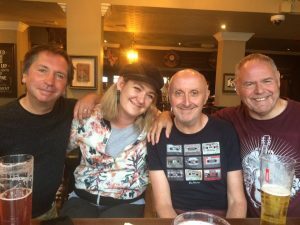 Local collectors Pete Burridge, Mat Roberts Steve Livesley and Dave Crane are fellow local vinyl enthusiasts who have the vinyl buzz and our finds are often on our respective Facebook pages. However I do have to report that saturation point has just about been been reached. I do still have an ongoing wants list but it is shrinking. There well may be something of a down sizing in the albums at some point ahead – of course that wont stop me adding one or two where required! This year’s list is all about B Sides.. Yes B sides.. .the flip side to those 45RPM singles – the track that would be placed as the B side to the A side of a single. In the formative days of the 45 RPM single, this often took the format of a throwaway song to make up the record. Sometimes these songs were concocted to extend the publishing royalty’s whereby the group would take credit for the hastily written number to gain financially. 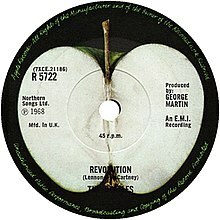 Eventually B sides were deemed more important than that and unsurprisingly The Beatles were the catalyst for change. Such was the quality of their songwriting their B sides became almost as well known as their A sides. This led to them taking the bold step of occasionally prompting their singles ”Double A Sides” – notably Day Tripper/We Can Work it Out, Yellow Submarine/Eleanor Rigby and Penny Lane/Strawberry Fields Forever. 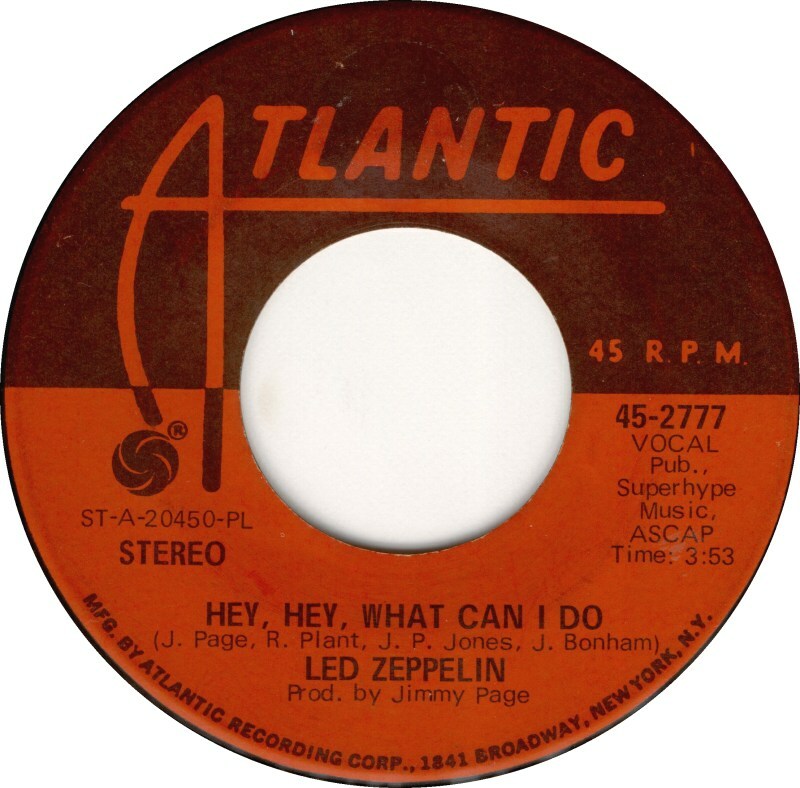 Of course, in the UK Led Zeppelin did not play the official singles game – but they certainly did in America and I was lucky enough to get hold of import copies of their singles – the most revealing B side being Hey Hey What Can I Do – a leftover from the Led Zeppelin III sessions that would eventually be added to the New Age of Atlantic compilation. That gem remains my favourite B side of all time. 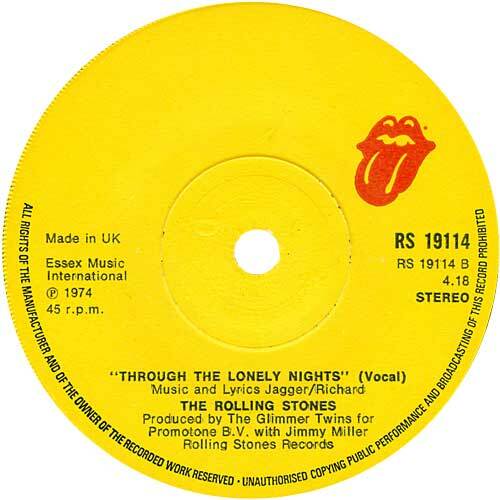 Having been weaned on the juke box delights of the B side, I always made a big effort to play the B side of any single I purchased – and later working in record shops gave me easy access to finding out the flip side of many a 45. I quickly built up a whole host of B side favourites. Often these would be one off tracks not available on an album or a unique live performance. Others would offer quality album tracks on the B side prompting further investigation of the album in question. Some acts made the B side into something of an art form – The Beatles, The Rolling Stones and The Jam were prime exponents. Latterly and heavily influenced by the previous three acts, Oasis took it upon themselves to issue unique not available anywhere else one off tracks on their singles. Enough for a whole album of their B side to be collated as The Masterplan album in 1998. So…as my penchant for collecting singles continues unabated and B sides are something that add to the collectability and enjoyment of those 45 RPM delights. I therefore felt it was high time to wade through the countless singles I have at my disposal to come up with a list of my all time fave B sides. On the occasion of my 62nd birthday appropriately enough – 62 of them. No apologies for the inclusion of a fair few Beatles, Stones and Jam selections amongst them – and Robert Plant has served up a few flip side faves himself. In condensing them to 62, I’ve left out a number of other esteemed B sides – I will therefore be regularly flagging up more of these B side beauties on the TBL website postings ahead. Of course in this age of Downloads the B side is something of a dying art – which is even more reason to celebrate the sheer beauty of the seven inch B side. 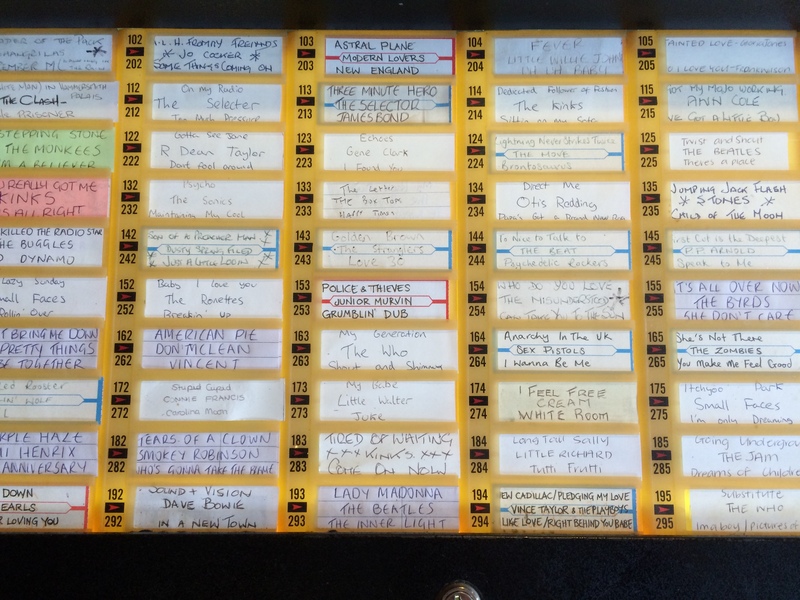 Vinyl Juke Box’s are also something of a relic now and rarely seen in pubs. 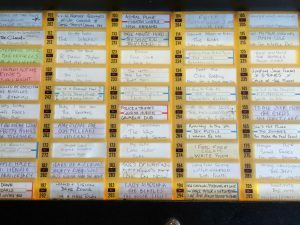 However, on our recent visit to Brighton I was well pleased to find a genuine vinyl juke box – in a pub in the Lanes area – and as can be seen in this pic, it was stacked with seven inch vinyl gold. We were only in there briefly but given more time the B sides I would have put on from this lot would have included Jimi Hendrix 51st Anniversary, Dusty’s Just A Little Lovin’, The Beatles The Inner Light and The Rolling Stones Child Of The Moon. It’s a B side world…we just live in it..
September is already well packed with the John Bonham Celebration concert in Redditch, the publication and launch of the Evenings With Led Zeppelin and the TBL ”It’s Been A Long Time 1968 -2018” Event at the Atlas pub Fulham on September 30. As for other future objectives, as ever I have many ideas under consideration – including a possible reissue programme of the early TBL magazines, a possible best of TBL compendium and my own memoirs somewhere along the line. 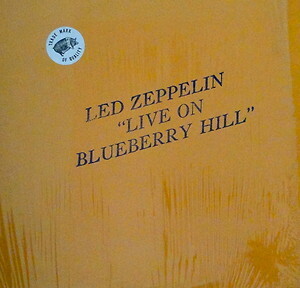 Online rumours suggest that Japanese bootleg label Empress Valley will release the full soundboard recording of Led Zeppelin’s September 29, 1971 Osaka, Japan show on September 29. Several tracks from the recording have been released already this year. Led Zeppelin will release four different international versions of its upcoming photo book. The book will be printed in limited editions for Japanese, German, Dutch and Italian markets. Customers who pre-order Led Zeppelin’s upcoming photo book from specific independent retailers or through publisher Reel Art Press’ website will be given a limited edition poster. See the list of stores here. The Financial Times interviewed the current owner of Hammerwood Park, a house owned by Led Zeppelin in the seventies. September 7 – Led Zeppelin will release the remastered edition of “The Song Remains The Same” and new merchandise. September 9 – Robert Plant will perform at LouFest in Missouri. 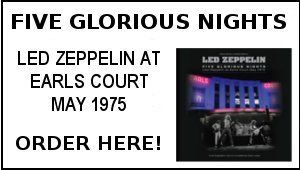 48 years ago on September 4 1970, Led Zeppelin performed a memorable show at the Los Angles Forum – it was captured by more than one enterprising fan and subsequently released on a variety of bootlegs. 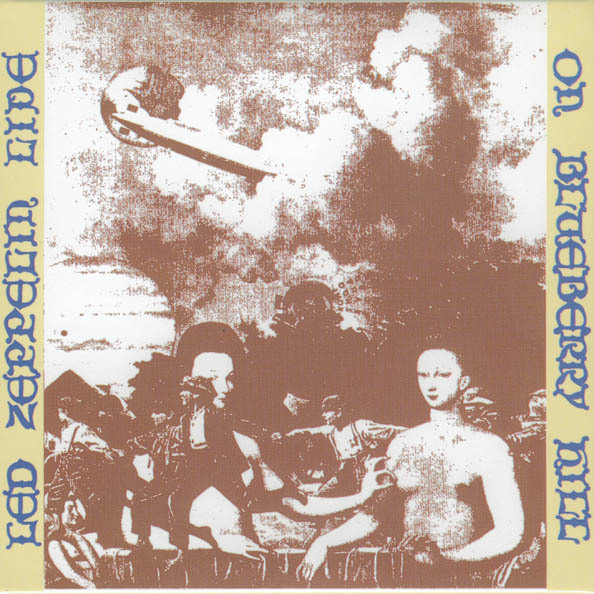 It remains for me and countless others one of THE essential Led Zeppelin recordings. To mark the 48th anniversary of what we know and love as Live On Blueberry Hill, here is an TBL archive special this is one of the chapters in the Celebration II – The Tight But Loose Files book published by Omnibus Press in 2003. This Friday will mark 50 years to the day that the four musicians who would become Led Zeppelin performed their first ever gig. The tribute band Coda are celebrating this momentous occasion by going back to the very location where this happened to perform a showcase gig. On September 7th 1968, Led Zeppelin played their very first gig in a school hall in Gladsaxe, Copenhagen. They went on to become the biggest and most influential rock band of all time. On September 7th 2018 my band, CODA – a Tribute to Led Zeppelin will be paying homage to our favourite band by playing a special show at the same venue, exactly 50 years to the day! Ever since I was given a copy of Led Zeppelin II by a school friend at the age of 17, I have been hooked on the music of Led Zeppelin. At that time I was teaching myself to play the drums, and what better mentor to have than John Bonham, with his powerful, inventive grooves, his incredible feel and fantastic musicality. Several years later and I was trying to form my very first Led Zeppelin tribute band, and have been trying ever since then to form the ultimate tribute to the ultimate rock band, and I think I have finally achieved this with CODA. Four musicians who have the skill to pull off the music of Led Zeppelin, and the ability to reflect their on-stage personae and to create an atmosphere akin to being at a real Led Zeppelin show. The journey to Copenhagen started in October 2017when I had a plan to celebrate 50 years of Led Zeppelin with three unique concerts, marking three key ‘firsts’ in Zep’s formative year. One: Their very first show, two: their UK debut and three: their debut in London. With this in mind I contacted the head teacher, Camilla Hoffmann, of Gladsaxe Skole, formerly Egegard Skole, in whose hall the band had exploded onto the music scene to an audience of around 1300 Danish teenagers back in 1968. As luck would have it, she was very receptive to the idea and the die was cast! We hired the hall and started to make plans for our show, no mean feat considering we would be travelling around 800 miles to a different country. Fast forward to the present day and we have now managed to finalise all the arrangements, thanks to the superb help of Jorgen Angel, the photographer who took the very first live pictures of Led Zeppelin. Thanks to Jorgen’s involvement, we have also managed to get Lars Abel involved with the gig. Lars was the president of the Gladsaxe Teen Club who booked Led Zeppelin for their debut show and he has also been very helpful and arranged some publicity for the show,, and helped us to book a very important part of the event, the bar!He signed the contract for the original booking of Led Zeppelin, and also introduced Page, Plant, Jones and Bonham to the expectant audience. As well as this, we have also been in touch with Jerry Ritz, the promoter of their first tour, and he will also be at the show, with his wife who he met for the first time at that show 50 years ago and been with ever since. Jerry has also helped to promote our gig, and we are very grateful for all the people who have been helping us with the organisation of this show, including Christian Buch and all the other teachers and parents at the school. Both Jorgen and Lars will be talking about Led Zep’s historic debut, and will also be introducing CODA! We also hope to have a member of the band that supported Led Zeppelin there to talk about that night. On the same day, Jorgen Angel is also releasing a brand new book that he has provided the pictures for, by local author Soren Vangsgaard. 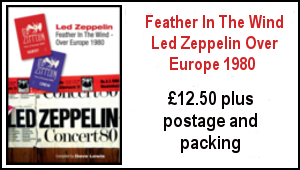 The book is about Led Zeppelin’s concerts in Denmark, 1968 – 1970. He will also be selling copies of this and his fantastic lithograph of pictures taken on 7th September 1968 at our gig. This is an incredibly exciting gig for us, and we can’t wait to play on the same stage that Led Zeppelin played for the very first time, exactly 50 years ago, and we are looking forward to sharing our love of the music of Led Zeppelin to hundreds of Led Zeppelin fans. 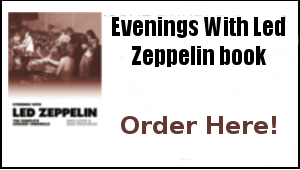 If you can’t get to Copenhagen on Friday 7th September, then we are celebrating Led Zeppelin’s debut in the UK with a show at Trillians, Newcastle, on Thursday 4th October, and also their debut in London on Thursday 18th October at O’Neill’s, Wardour Street. At 7pm each Sunday during Zeptember we’ll be playing a special show delving into the history and legacy of Led Zeppelin. My thoughts on The Rolling Stones Now – Quarry Theatre Bedford August 31, 2018. 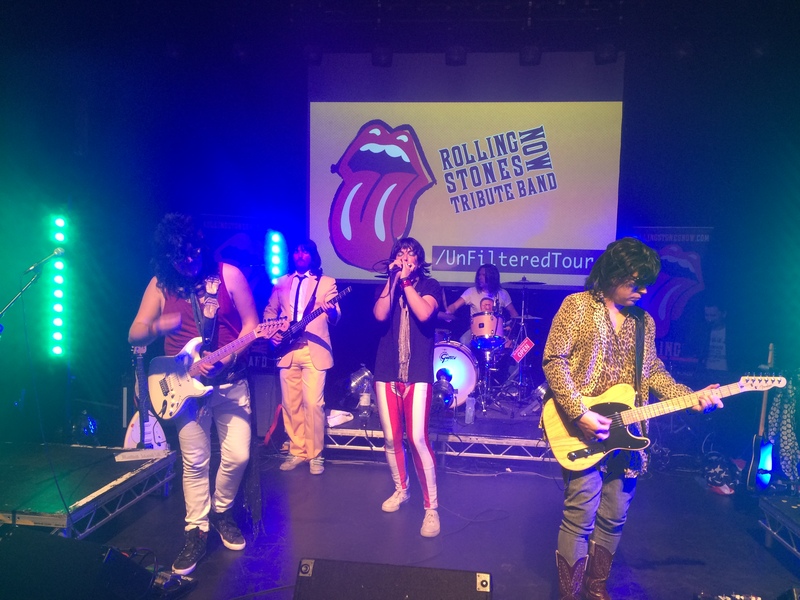 Rolling Stones tribute bands are always going to be on a bit of a tightrope in striking the right balance – the real band themselves have bordered on self parody at times during their long career. Last night, at the excellent Quarry Theatre in Bedford The Rolling Stones Now got it absolutely right. 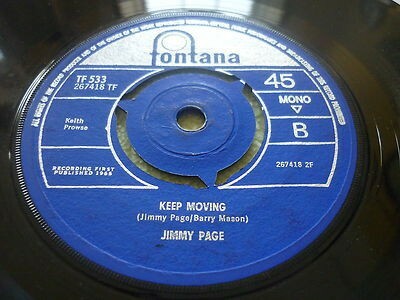 The did so with two very balanced sets – the first mainly concentrating on the Brian Jones era. It …was good to hear the likes of Route 66,Little Red Rooster and Midnight Rambler performed with total authenticity. 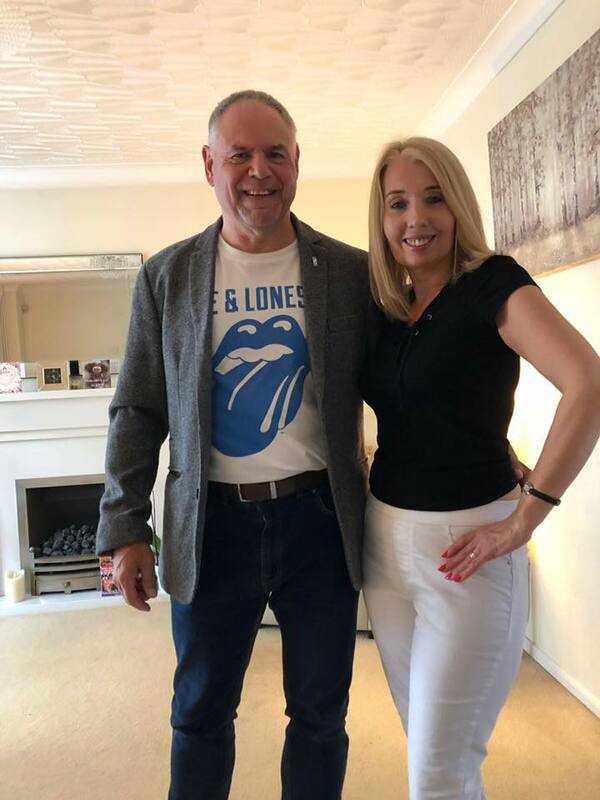 The very affable lead singer moved like Jagger without looking pretentious – he’s certainly viewed the more recent Stones videos and has the past and present Jagger moves off pat. The bulk of the second half showcased the latter Stones era and it really was a case of what’s not to like? Start Me Up, Miss You, Gimme Shelter, Brown Sugar ,Satisfaction and It’s Only Rock’n’Roll – the hits kept on coming. Celebratory encores of You Can’t Always Get What You Want, Jumpin’ Jack Flash and Dylan’s Like a Rolling Stone (which the Stones have performed themselves live in the past ) had the audience totally engaged. The VIP Record Fair is staged at the Horticultural Halls, 80 Vincent Square, Victoria, London this Saturday, September 8 – always an excellent Fair, I am aiming to be in attendance and this will act as a bit of a post Birthday extended celebration -I will duly adjourn to the nearby pub The Royal Oak to toast my coming of age. I look forward to seeing all that can make it along. On Saturday it was time for the Annual pre Birthday Pub Crawl Bike Ride and with tyres pumped up and chain oiled, I met with my very good friend Max. As we have for a good few years now we travelled the byways of Bedford stopping off at a fair few pubs along the way – ten in all as follows: The Park Hotel, The Burnaby Arms, The Kent Arms, The Balloons, The Wellington, The Bear, The Standard, The Rose, The Ship and The Fox and Hounds. A steady half a pint in each quenched the thirst before we met with the ladies for an evening meal. It’s great to have my very good friend Dec over from Ireland this week – his daughter Alice is also over. Today we will be having an early morning breakfast and a public house or two will be visited…in the evening we will be converging on our local Fox and Hounds pub for a bit of a reunion for my Birthday with a fair few friends. It’s also fantastic to have the good lady Janet, Adam and Sam all here today. 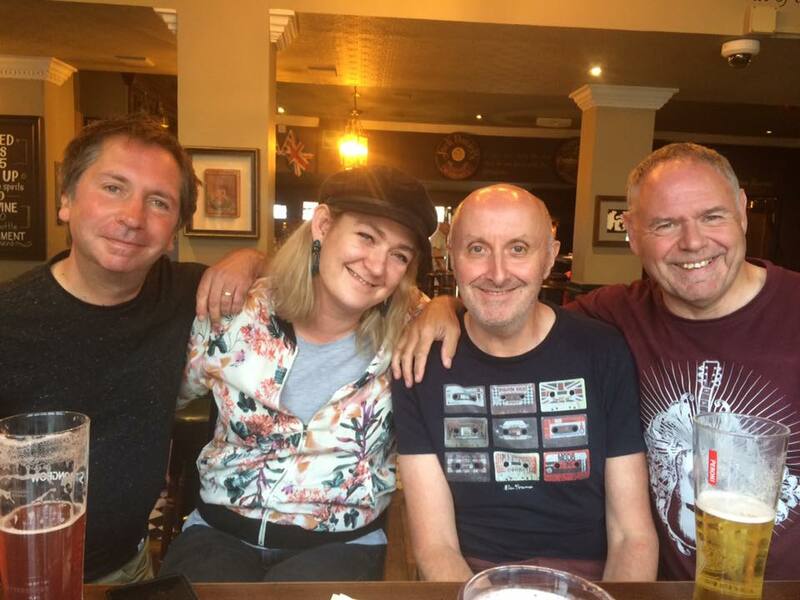 The pic below is fellow Bedford musicologist Pete Burridge , Alice , Dec and myself yesterday afternoon – I have to say Pete beat me convincingly in the ad hoc music quiz we staged – his knowledge is vast! On Saturday, the post Birthday celebrations will continue at the Victoria Fair. In between all that, there’s a lot of work ongoing here – with LZ Live 1975 – 1977 books to a pack, TBL 44 to crack on with and various other projects to get moving. Thanks for all your support and interest in making this happen. On the 5th, I was so busy packing the stuff for my trip to Manchester (Arctic Monkeys at the Arena, 6th) and then Portmeirion (Festival No.6, 7th-9th). Back home, I’m posting this in a pretty knackered body state. A little trivia for you here. Robert Plant seems to like Arctic Monkeys. When he and the Shifters were fixed to the lineup for the Summer Sonic Festival in Japan, 2014, he was reported to make a comment, “It’s nice to play prior to a great band like Arctic Monkeys [the fest’s headliner]” And back stage on the show day, Alex Turner was interviewed by the media, looking fidgeting and impatient for fear of missing Robert and Co’s set that was to start soon. A mutual respect there. Whatever happened to Rosie and the Originals? A lot to comprehend here. First, hope you had a fantastic birthday! Then your B-side listings is another very enjoyable read. Great to also hear your appreciation of CDs. Although I have some vinyl, CDs make up most of my collection. I also love the idea of reissuing the early TBL mags! Thankyou for all your wonderful work. Thank you for carrying the torch for all things Zep. Loved the B sides touch especially the early T.Rex ones. Could I throw ‘Thunderwing’ in? (B side of Metal Guru). Dave. Happy Birthday. 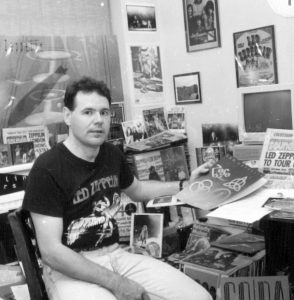 Your work and insight to Led Zeppelin is insurmountable! If you ever require any support with design work I would be more than willing to help. 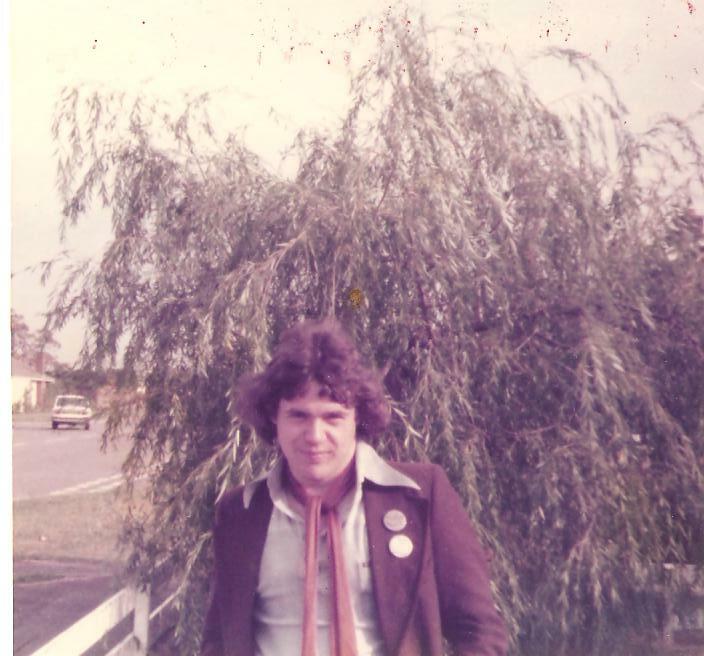 A graphic design professional who had the pleasure of being taught by George Hardie at Newcastle Polytechnic from 83-86 and got a real insight to his work with Hypnosis and his work with Zeppelin. I would be more than happy to lighten any burden! great B sides there Larry! Happy Birthday Dave, and thanks for your continuous outpouring of Zep information and product. Great article on ‘B’ sides. Can I just add to your list “Twilight Alehouse”, the B side of Genesis’ “I know what I Like” 1973 single – good enough to have been on Nursery Crime or Foxtrot IMHO. Quite anonymous follower of your blog since many years. Heard LZ for the first time in 1969 when i was 9, single WLL but i preferred the b side living lovin maid. Became a die hard fan as of 1977 when i got the physical graffiti lp. Thanks for maintaining the LZ legacy vivid. Great reading. Have you ever done a spreadsheet or record of your music? What a collection you must have! Happy Birthday, Dave, and keep rockin’!!! Enjoyed your post and of course none of us are getting any younger and life brings its inevitable changes and challenges but we knock ’em down until they get set up again. 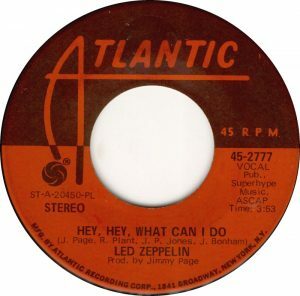 Hey Hey What Can I Do (Immigrant Song), 1970 – surely the greatest b-side of all time! Rita May (Stuck Inside of Mobile With the Memphis Blues Again), 1976 – This release emanated from Bob Dylan’s excellent and rare Masterpieces set, but Rita May was recorded during the sessions for Desire, one of his greatest albums in my opinion. An up-tempo ditty with the great Emmylou Harris on backing vocals and the mesmerizing violinist Scarlet Rivera, who added so much to that LP. Silver Springs (Go Your Own Way), 1976 – from the Rumours era, one of Fleetwood Mac’s greatest songs that somehow didn’t wind up on the album. Incident on 57th Street (Fire), 1987 – a 10-minute live version (recorded at Nassau Coliseum in December 1980), b-side to a live single of Fire from Bruce Springsteen and The E Street Band’s monumental Live 1975-85 box set. A Springsteen NYC set piece, what makes this remarkable is his passionate vocal delivery and one of his best (and longest) guitar solos on record. Rain (Paperback Writer), 1966 – I believe many refer to this as a “double a-side” and rightfully so. One of the great Beatles singles. Sick City (Don’t Let The Sun Go Down On Me), 1974 – Elton John beating Zep’s Sick Again by a year, this is also a sort of mean groupie song powered by a weird piano groove. Cocaine Eyes (Eldorado), 1989 – it might not be fair to call this rampaging Neil Young monster a b-side as it first appeared on the Eldorado EP in 1989, six months before the Freedom album, which used different mixes of 3 of the 5 tracks which initially appeared on this EP. The Eldorado EP interestingly only appeared in Japan and Australia. Cocaine Eyes did finally show up as a b-side on the classic Young track Rockin’ In The Free World from the Freedom LP. 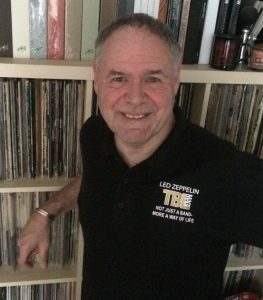 Best wishes Dave ,have a gud un.TBL is still the main outlet for all things Zep related,I’ve been subscribing for the last 25 years & have loved the magazine!Everonward,all the best Swin. Happy Birthday Dave! Might as well start the 50th a couple days early! Throw on the Beatles Birthday song and then ‘Hey Hey, What Can I Do’! ’62! Stellar (meaning typical) Dave Lewis prose passion. Here’s to the day we lift one in a pub together. Heres to thee. I’m so glad you were born. And thanks for all you think , feel, write and produce. Happy Birthday, Dave! All the best from the States on your big day. You do a great job on all things Zeppelin, and fans around the world thank you for it. I have to remember that you and I were both at the Knebworth gig on the first night, though seperated by tens of thousands of people! Small world, but connected by the mighty Led Zeppelin. Track up Celebration Day! Re B sides: The “hot side” pays the bills, the “not side” that’s for thrills! An economics lesson contained in .”It’s Only a Flip Side” by Red Symons from 1977.